The list below is for the week of April 15 - April 20. Results as of 8:00 PM, Saturday, April 20, 2019. 12.84 Stacey Howard 9 Milw Academy of Science 04/05 Oostburg Flying Dutchman Inv. 27.67 Kathleen Mathias 12 Darlington 03/26 Pioneer HS Meet @ UW-Platt. 1:00.51 Hannah Constable 11 Johnson Creek 03/26 Oshkosh [SM] Inv @ UW-Osh. 1:02.11 Allison Taylor 11 St. Mary's Springs 03/26 Oshkosh [SM] Inv @ UW-Osh. 2:29.27 Jamie Huber 12 Dodgeland 03/26 Oshkosh [SM] Inv @ UW-Osh. 2:32.22 Jordan Zdroik 11 Rosholt 03/26 Oshkosh [SM] Inv @ UW-Osh. 5:32.87 Meygan Benzing 12 Dodgeland 03/26 Oshkosh [SM] Inv @ UW-Osh. 5:34.92 Sylvia Hansen 10 Gillett 03/26 Oshkosh [SM] Inv @ UW-Osh. 5:39.67 Carolyn Shult 12 Augusta 04/16 Eleva Strum Cardinal Inv. 5:44.79 Olivia Stenzel 10 Sevastopol 03/26 Oshkosh [SM] Inv @ UW-Osh. 12:24.67 Jenna Krebs 9 Rosholt 03/26 Oshkosh [SM] Inv @ UW-Osh. 12:36.52 Taylor Krogwold 12 Rosholt 03/26 Oshkosh [SM] Inv @ UW-Osh. 17.26 Josie Stender 10 Regis 04/16 Eleva Strum Cardinal Inv. 17.74 Riley Naumann 9 Eau Claire Immanuel 04/16 Eleva Strum Cardinal Inv. 52.76 Regis 04/16 Eleva Strum Cardinal Inv. 54.04 Mondovi 04/16 Eleva Strum Cardinal Inv. 1:54.06 Regis 04/16 Eleva Strum Cardinal Inv. 1:55.24 Rio 03/26 Oshkosh [SM] Inv @ UW-Osh. 4:22.55 Johnson Creek 03/26 Oshkosh [SM] Inv @ UW-Osh. 4:23.99 Dodgeland 03/26 Oshkosh [SM] Inv @ UW-Osh. 4:34.15 Fennimore 03/26 Pioneer HS Meet @ UW-Platt. 10:19.22 Dodgeland 03/26 Oshkosh [SM] Inv @ UW-Osh. 40' 09.50 Aubrey Schoenemann 11 Mercer 03/21 Northland Pines Indoor Inv. 37' 07.00 Sydney TenHaken 12 Oostburg 03/21 Brillion Indoor @ Ripon Col.
37' 03.00 Holley Severson 11 Markesan 04/18 Princeton/Green Lake Inv. 36' 06.50 Valentina Stueck 10 Mishicot 03/15 Raider Invite at Sheboygan So. 100' 00 Ashton Osterhaus 12 Pardeeville 04/18 Princeton/Green Lake Inv. 15' 09.50 Anna Bubolz 11 Weyauwega-Fremont 03/26 Oshkosh [SM] Inv @ UW-Osh. 15' 09.00 Aubry DeBauch 10 Gillett 03/21 Brillion Indoor @ Ripon Col.
15' 08.00 Kaitlyn Erickson 11 Prentice 03/21 Northland Pines Indoor Inv. 34' 06.75 Jordyn Hutzler 12 Rio 03/26 Oshkosh [SM] Inv @ UW-Osh. 33' 02.00 Bria thalacker 11 Regis 04/16 Eleva Strum Cardinal Inv. 32' 09.00 Emily Fink 10 Three Lakes/Phelps 03/21 Northland Pines Indoor Inv. 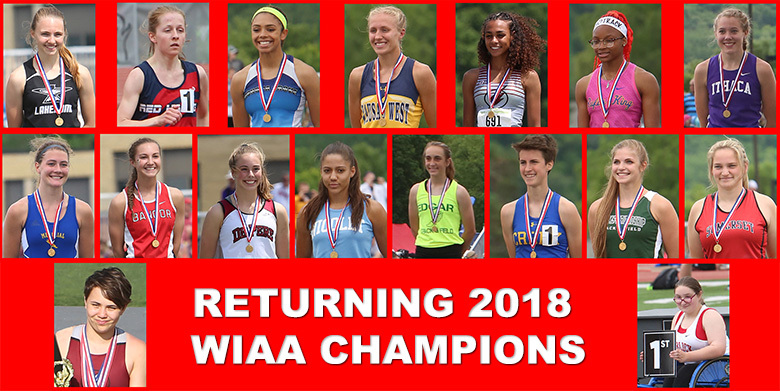 32' 08.75 Hannah Constable 11 Johnson Creek 03/16 Deerfield Indoor @ Ripon Col.
5' 00.00 Lexi Franz 12 St. Mary's Springs 03/26 Oshkosh [SM] Inv @ UW-Osh. 4' 11.00 Kristina Peterson 10 Chequamegon-Park Falls 03/30 21st T-Bird Inv @ Lakeland Un. 09' 00.00 Ayla Fairchild 12 Three Lakes/Phelps 03/21 Northland Pines Indoor Inv. 08' 06.00 Addie Soda 12 Princeton - Green Lake 04/18 Princeton/Green Lake Inv.